Welcome to our final Election Update for the 2018 Senate races! Not much has changed in our forecast since early October: Republicans are still favorites to keep control of the Senate, with a 5 in 6 (83 percent) shot.1 What’s more, as we close in on Election Day, all signs point to the House and Senate moving in opposite directions this year. (As I’ve written before, this is weird but not unprecedented.) Republicans’ odds in the House are nearly the reverse of where they stand in the Senate: The GOP has a 1 in 8 (13 percent) chance of retaining a House majority. Republicans have a 50 percent chance of adding at least one senator to their tally. Meanwhile, Democrats have a 32 percent shot of picking up at least one seat. But there is also nearly an 18 percent chance that there will be no net change — in other words, the status quo will be preserved and the GOP will hold on to its current 51-to-49 majority. But tomorrow night could play out in many different specific ways. After all, there are 13 seats that we consider to be competitive. We get 13 by ignoring seats that have either a “solid Democratic” or “solid Republican” rating3 in the forecast. The table below shows the likelihood that one of these seats flips by calculating the difference in win probabilities (subtracting the challenger party’s likelihood of winning from the incumbent party’s). Mississippi’s special election is a nonpartisan blanket election that could go to a runoff election. Cindy Hyde-Smith (R) and Mike Espy (D) are the most likely to advance. The most endangered seat for Democrats is North Dakota. Republican Rep. Kevin Cramer is about a 3 in 4 (74 percent) favorite over incumbent Democratic Sen. Heidi Heitkamp. Cramer has routinely led in the polls, and this seat was always going to be a tough hold for Democrats: Heitkamp was one the biggest upsets in 2012, winning her first Senate race by just 1 point. Plus, North Dakota is 33 points more Republican than the rest of the country,4 making it the reddest seat that Democrats are defending this cycle. But Democrats might be able to pick up Arizona, an open-seat race to replace retiring Republican Sen. Jeff Flake. The forecast shows Democratic Rep. Kyrsten Sinema with a slim 3 in 5 (61 percent) advantage over GOP Rep. Martha McSally. And regardless of who wins, the victor will be the first female senator from Arizona, which is a boon for a night expected to hold big gains for women’s representation in Congress. The two closest contests of the night are expected to be the toss-up5 races in Missouri and Nevada. Each party has an endangered incumbent (Democratic Sen. Claire McCaskill in Missouri and Republican Sen. Dean Heller in Nevada), but arguably the Republicans are worse off in trying to hold onto their seat. In Missouri, McCaskill has a narrow 4 in 7 (56 percent) edge over Republican state Attorney General Josh Hawley. And in Nevada, Heller is the most vulnerable Republican incumbent in 2018. Democratic Rep. Jacky Rosen has a 5 in 9 (56 percent) chance of defeating Heller, which would be a Democratic pickup. As for the remaining seven seats, they are all “likely”7 holds for the incumbent party — meaning a challenger could still win, but we have now entered major upset territory. Republicans are defending three such seats and Democrats four. As for Democrats’ four “likely” seats, two are located in deep red states. In Montana, an R+18 state, Democratic Sen. Jon Tester has a 4 in 5 (79 percent) chance of defeating Republican state Auditor Matt Rosendale. Tester’s odds aren’t bad, but of the likely Democratic seats, he’s the closest to being bumped into the lean category. And in West Virginia, Democratic Sen. Joe Manchin is a 7 in 8 (88 percent) favorite against Republican state Attorney General Patrick Morrisey in an R+30 state. Montana and West Virginia have seen less polling than other competitive states, so we’d caution you not to write off the Republicans. The other two likely Democratic seats are in blue states and look like firmer bets for the party. Appointed Democratic Sen. Tina Smith is an 11 in 12 (91 percent) favorite to defeat Republican state Sen. Karin Housley in Minnesota’s special election. And despite his scandals, New Jersey Democratic Sen. Bob Menendez has an 19 in 20 (95 percent) chance of defeating Republican Bob Hugin, a former pharmaceutical company executive. Republicans will likely hold on to the Senate in part because Democrats have so many tough seats to defend. The likeliest outcomes range from a GOP gain of four seats to a Democratic gain of two, but only the latter could take away the GOP’s majority. Democrats would need a near-perfect night to win the Senate. Still, the final count will have important consequences for the 2020 Senate landscape. In the Classic version of our forecast, which includes fundamentals along with polling data. Data is as of 11 a.m. Eastern. The Democrats’ tally includes the two independents in the chamber, Sens. Angus King of Maine and Bernie Sanders of Vermont, who caucus with the party. 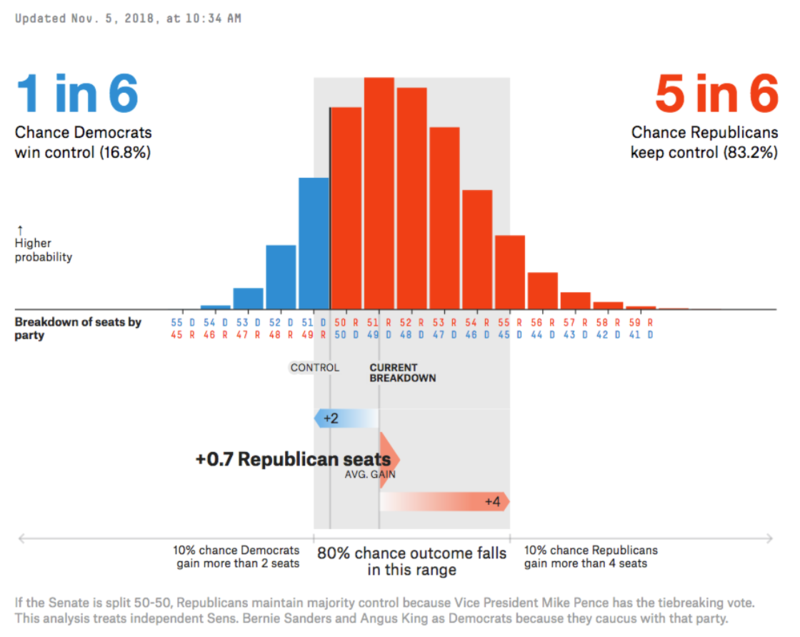 Seats in which one candidate has a chance of winning of at least a 95 percent. According to FiveThirtyEight’s partisan lean, which is based on how a district voted in the past two presidential elections and state legislative elections. In our formula, 50 percent of the weight is given to the 2016 presidential elections, 25 percent to the 2012 presidential election and 25 percent to state legislative elections. Toss-ups are seats where neither candidate has at least a 60 percent chance of winning. Races in which the favorite has a chance of winning between 60 and 75 percent. Races in which the favorite has between a chance of winning between 75 and 95 percent.